Creating a classic advertising campaign is something all advertising agencies aspire to. Yet, for Design Inc, this took on a whole new meaning recently. The past few years have seen Design Inc deliver a number of creative projects for a wide range of financial services companies. So when logbook loan company, Varooma contacted us in February to discuss a new advertising campaign, we were delighted. Varooma specialise in offering short term finance to consumers, providing thousands of logbook loans to customers throughout England and Wales, whilst enabling those car owners to continue driving their cars! A recent decision has been made to open up their advertising to the classic car market and Design Inc were brought in to develop their new advertising campaign for this market. After agreeing the general brief, our first job was actually to get under the skin of the various classic car publications in which this advert would appear. Classic Cars, Classic Car Weekly, Classic & Sportscar magazines were all discussed so we set to task researching the advertising styles within these publications, understanding the advertising of competitors and, of course, investigating what Varooma had had done historically within the non-classic car market. What we found was interesting, to say the least. Very few advertisers seemed to portray a confident brand style. Advertising was often very bland, very safe, very reserved. To be honest, in our mind, so was the client’s previous advertising style. Our core solution was to create stand-out design impact for this client within these publications. A style that played upon the strength of their brand style, a design that would be unique and a message that truly shouted ‘look at me, this is what we do’. 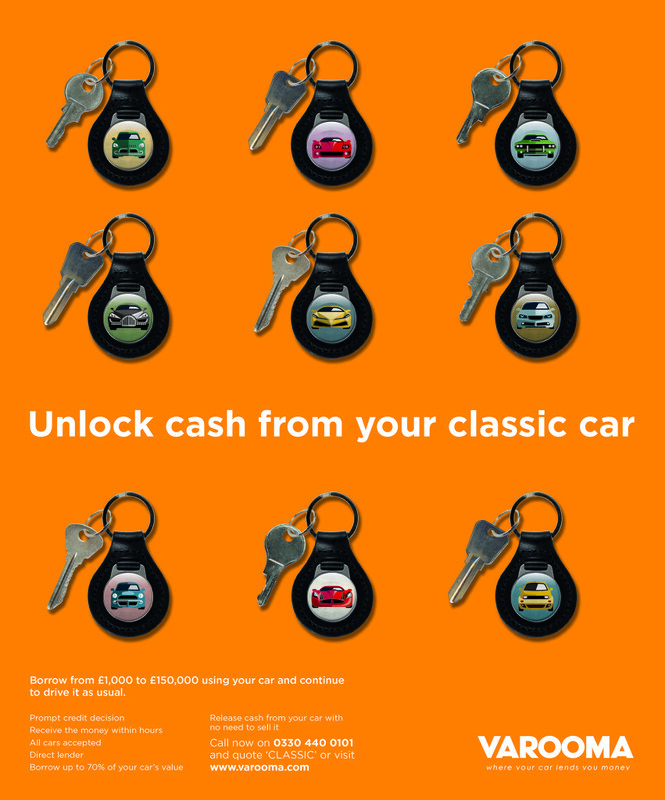 The outcome was a striking classic advertisement campaign based on the simplistic use of car keys, which deliberately upset the norm and went against the grain of the corporate classic car sector. Who would have thought that bright orange could prove successful amongst a ‘British Racing Green readership’? Well, we did. And, by the results the client has already experienced, so did the readership. So, another project complete, another happy customer and the building of a very strong relationship.